There are so many similes that go along with this espresso machine (coffee as ‘diesel fuel’; waking up as ‘starting your engine’) that they seem unavoidable. Even if you’re not a gear head, though, it’s easy to appreciate this beauty by Espresso Veloce. 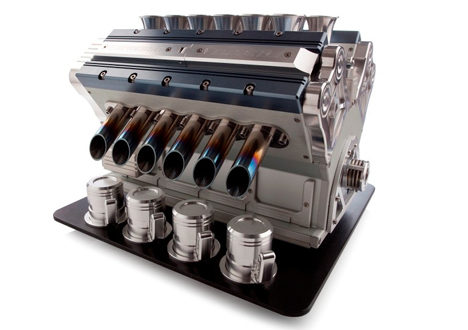 The ‘V12’ is part of their series of coffee makers that pay tribute to the grand prix engines of the 90’s. The series includes a ‘V8’ and ‘V10’, but why settle for lesser power? This replica engine was ‘tool room engineered’ and is constructed of various alloys such as magnesium, titanium and aluminum. According to EV’s website, the engines are a throwback to those raced by Formula One legends such as Michael Schumacher and Ayrton Senna. 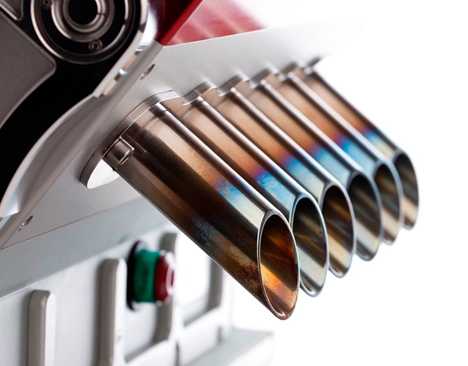 After the ingredients are processed, in true automotive fashion the coffee is dispensed through an exhaust pipe. 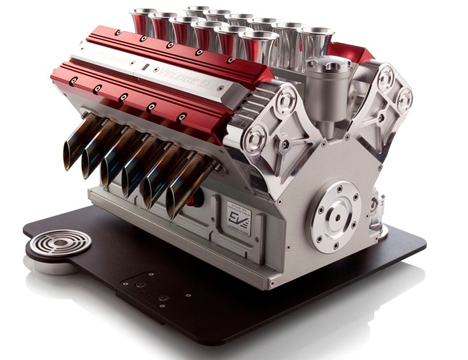 The V12 has a feature that allows you to truly turn your coffee into diesel fuel. 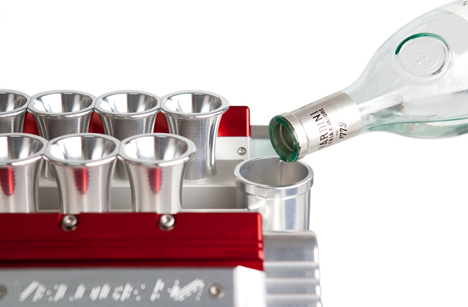 It has an ‘oil filler’ that allows you to store your favorite liquor. Espresso Veloce calls it a ‘grappa reservoir’ that perfectly mixes the liquor in with the espresso for a true caffé corretto. Available in colored titanium or black carbon finish, this piece is destined to win design gold.